This is also the earliest 80° temperature on record at Portland. This is also a new monthly record for March at Bangor (previous 79° in 1946). High temperature records have already been broken before noon today in New England. Boston's temperature of 73° at 11:45 am broke the old record of 72° in 1948. Boston's climate history dates back 140 years to 1872. At Portland, Maine, the 11 am temperature of 74° was 4° above the old record for March 22 of 70° in 1948. Yesterday's high of 79° crushed the previous record of 60° in 1946. Official temperature records at Portland began in 1941. Providence, Rhode Island hit a record of 75° early this afternoon, beating the 74° also observed in 1948. Providence's climate history began in 1904. 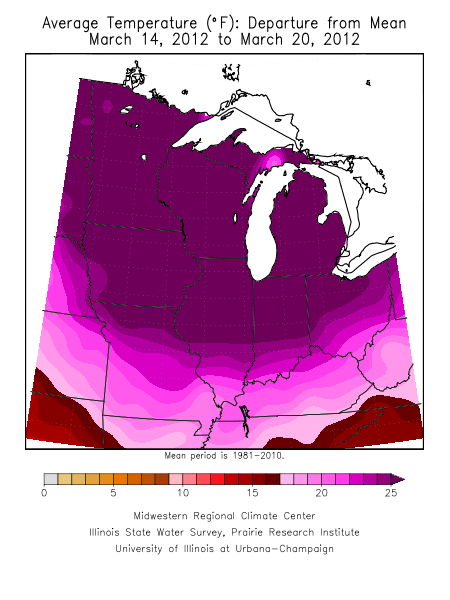 The onslaught of heat records this month is so furious that it's almost impossible to keep up. The National Climatic Data Center was forced to take its reporting system offline for several days to do emergency maintenance in order to cope, but the reports are still lagging by 2 days. 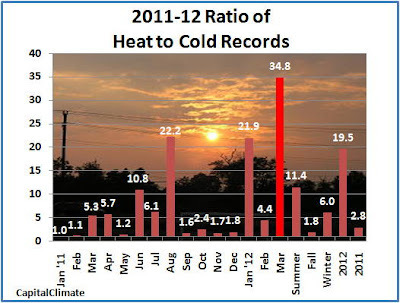 In just the 4 days since the previous update, data through Monday (March 19) show that the number of new daily heat records for March has more than doubled to nearly 4000, while the number of cold records has increased by less than 20, to 113. This gives an astonishing ratio of 34.8 to 1, over 50% above last August's incredible pace. For the year to date, the ratio is approaching 20 to 1, nearly 10 times the pace of the previous decade. HIGH TEMPERATURE RECORD...WHICH WAS 80 DEGREES...SET JUST YESTERDAY. HIGH TEMPERATURE...WHICH WAS 81 DEGREES...SET JUST YESTERDAY. DEGREES SET BACK IN 1946. EARLIEST OCCURRENCE OF 80 DEGREES WAS ON APRIL 12TH IN 1968. ESTABLISHED ON MARCH 21ST IN 2000. LOCATED IN NEGAUNEE TOWNSHIP DATE BACK TO 1961. 74 DEGREES. THIS BREAKS THE OLD RECORD OF 71 DEGREES SET IN 1918. IN ADDITION...THE LOW TEMPERATURE FOR MARCH 20 WAS ONLY 57 DEGREES. 46 DEGREES SET IN 1884. THROUGH MARCH 29TH OF 1910. FALLS MN TODAY. THIS BREAKS THE OLD RECORD OF 56 SET IN 1987. DEGREES...WHICH EXCEEDED THE OLD RECORD BY 13 DEGREES. THE PREVIOUS RECORD OF 37 DEGREES WAS SET ON MARCH 20TH 1918. DEGREES...WHICH EXCEEDED THE OLD RECORD BY 16 DEGREES. THE PREVIOUS RECORD OF 41 DEGREES WAS SET ON MARCH 20 1938. Preliminary record high temperatures in northern Maine this afternoon have not only crushed the previous daily records, they have also set new all-time March records by several degrees. At Houlton, where climate records date back to 1948, today's high of 79° obliterated the old record of 61° set in 1979, and it also surpassed the previous all-time March record by 4° . . . set yesterday. At Bangor, where climate records began in 1925, today's high of 83° destroyed the previous record of 64° in 1946 by 19°. This is also a record high temperature for the month of March by a margin of 4°, and it is the earliest 80°+ temperature by 3 weeks (previous was on April 11). At Caribou, the high of 75° smashed the old record of 57°, also in 1946, by 18°. The 64° at Caribou on Sunday was the earliest 60°+ temperature on record. Caribou also had its earliest 70° temperature yesterday (March 20) with a high of 73° (previous was on March 30). This also broke the old daily record by the incredible margin of 23° in a climate history which began in 1939. If the daily low temperature had been exceeded by a comparable amount, it would have been 32° below zero. March 21, 5 PM CDT Update: The preliminary daily high temperature was 87° at Chicago, blowing away the previous record from 1938 by 10° and tying the second highest March temperature in 142 years. March 21, 4 PM CDT Update: The temperature at Chicago has been 85° for the past 2 hours, so the 3rd warmest March temperature has been at least tied for the second consecutive day. The heat records keep on rolling at Chicago, where the National Weather Service reports the high temperature today of 85° crushed the 1921 record for the date of 76° by 9°. This made it the 3rd warmest March day ever, behind the 88° on March 29, 1986 and the 87° on March 31, 1981. It was also the 6th 80°+ day this month, further extending the record for most such days in March. It was already 80° by noon. The daily record had been broken an hour earlier, and the temperature is still 82° at 6 pm CDT. EXTENDING THE RECORD SET THIS MONTH FOR MOST 80 DEGREE DAYS IN MARCH. 1986 AND THE 84 DEGREES OBSERVED ON MARCH 31 1986. March 20, 9 AM CDT Update: The daily climate report from the National Weather Service confirms the record high minimum temperature at International Falls of 60°, and the Minnesota State Climatology Office reports that this is a new record for the entire month of March, breaking the previous record set 2 days earlier by 8°. The monthly average temperature to date is now 15.1° above average and 1.3° above the previous record warmest March. March 19, Midnight CDT Update: Some light showers lowered the midnight temperature to 62°, so it's likely that the incredible event of a new daily high minimum equaling the old daily high maximum in a climate history of over a century will be confirmed. March 19, 7 PM CDT Update: The daily high was 78°, an incredible 42° above average. If the low holds until midnight, the day will be a mind-boggling 44° above average. The month to date through yesterday was 11.9° above average, but today alone will add about 1.5° to the entire month. March 19, 4 PM CDT Update: Here's an indication just how crazy warm it is in northern Minnesota: Before today, the warmest it had ever been on March 19 in International Falls was 60° in 1918. That day also set the record for highest minimum on the date of 41°. However, today's morning low of 60° is warm enough to tie that record high. If it holds, it will break the old high minimum record by 19°. Meanwhile, the afternoon temperature has reached at least 77°, which is 17° above the old record high. This is also the third consecutive day with a high temperature above the pre-2012 March monthly high. As an outpost on the Canadian border near the northernmost point of the contiguous 48 states, International Falls, Minnesota jealously guards its reputation as "Icebox of the Nation"™. That reputation is seriously in jeopardy this spring as longstanding temperature records have been spectacularly demolished. With a climate history dating back 142 117 years to 1870 1895, it should be difficult to break daily temperature records by more than a degree or two. Instead, International Falls has broken high temperature records by double digits for the last 3 consecutive days. Yesterday's high of 77° absolutely crushed the old record of 55° in 1968 by a mind-boggling 22°. That was enough to soar past the previous March monthly high of 73° in 1963 by an equally astonishing 4°. Today's high of 79° surpassed that record by another 2°, far exceeding the previous record for the date of 66° in 1918. In the past 9 days, International Falls has set 6 new daily heat records by multiple degrees and tied one record. As the charts from the Minnesota State Climatology Office show, the persistent heat has virtually wiped out the snow cover in the state over the last 2 weeks.